A lot of plans with FREE smartphones are continuously offering by telecoms in the country. One of that is Sun Cellular, wherein they are currently providing their subscribers the Plan 1799 with FREE BlackBerry Z10. The Sun Plan 1799 includes unlimited Sun to Sun calls for both mobile and landline, unlimited text so Sun subscribers and 250 SMS monthly to other network plus 60 IDD minutes per month for making international voice calls. By availing this plan, Sun Cellular's subscribers will get the BlackBerry Z10 absolutely for FREE. Just to inform you guys, it is the newest BlackBerry phone of RIM. The BlackBerry Z10 is powered with the Qualcomm Snapdragon S4 Plus and uses the new BlackBerry 10 mobile operating system. It has touchscreen keyboard that provides an advanced typing experience. Other features of the phone include 8 megapixel camera on the back with autofocus, LED flash capable of shooting 1080p video, mobile hotspot functionality, Voice Control and others. 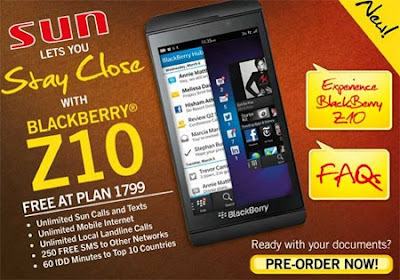 For more details on Sun Plan 1799, visit the nearest Sun Cellular store on you.